Perilla is prescribed by Asian herbalists for cough and lung afflictions, flu prevention, seafood poisoning, incorrect energy balance and restless foetus. Traditionally its used to treat a variety of diseases including depression, anxiety, tumours, cough, allergy, intoxication and some intestinal disorders. It is listed in the Chinese Pharmacopoeia and in TCM it is used for for asthma, influenza, cough, chronic bronchitis and vomiting. Monoterpenes, triterpenes, flavonoids, phenylpropanoids and phenolic compounds. It also contains essential oils including (-)perillaldehyde which forms its fragrance, (-) perillyalcholol, (+)limonene, alpha-pinene and trans-shisool. 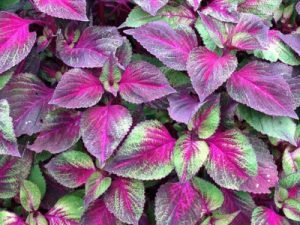 The red or purple plant contains the purple pigments shisonin and cyanin. There is also rosmarinic acid, scutellarian, luteolin, apigenin, adenine, arginine, ferulic acid, (+)-catechin, caffeic acid, chrysoeriol and isoegomaketone also. Perilla has traditionally been used for morning sickness and preventing threatened miscarriage, however as limited information is available to determine its safety during pregnancy it should only be used during pregnancy under the strictest supervision.